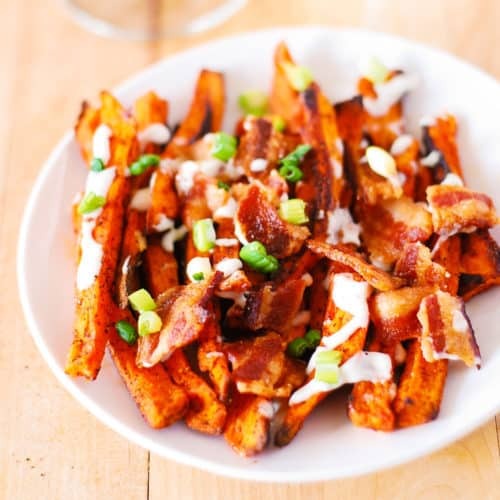 Spicy sweet potato fries with bacon – so easy to make. These thinly sliced sweet potatoes are sprinkled with smoked paprika, chili powder, cayenne pepper, and cumin and then baked in the oven. Mix them with cooked bacon and serve with spicy mayo or Ranch dressing! 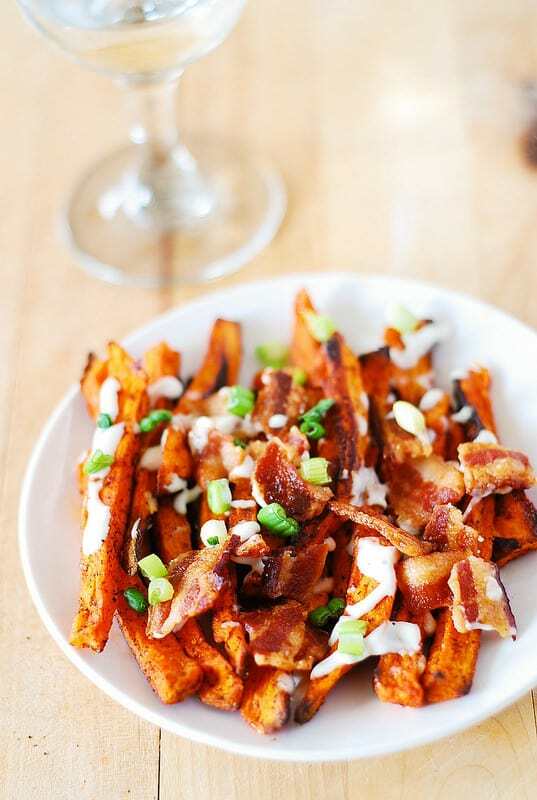 This sweet potato fry recipe makes a wonderful side dish (or an appetizer). I’ve been enjoying it so much lately. So easy to make! Prep takes about 15 minutes and baking time is 20 minutes. I prefer these spicy sweet potato fries over regular fries. These sweet potato fries are spicy, tossed in paprika, red chili powder, cayenne pepper, garlic salt, and even cumin (optional). They are baked to perfection and topped with freshly cooked bacon chopped in small bites. Sprinkle a little bit of mayo or a Ranch dressing to make these potato fries completely over the top! Mashed sweet potatoes with butter, maple syrup, cinnamon and Montreal steak seasoning – a perfect combination of sweet and savory flavors! Baked Chicken Thighs and Sweet Potatoes with Spinach and Creamy Sauce – easy, gluten free recipe where the sweet potatoes are the star ingredient – perfect for skin-on, bone-in chicken thighs. 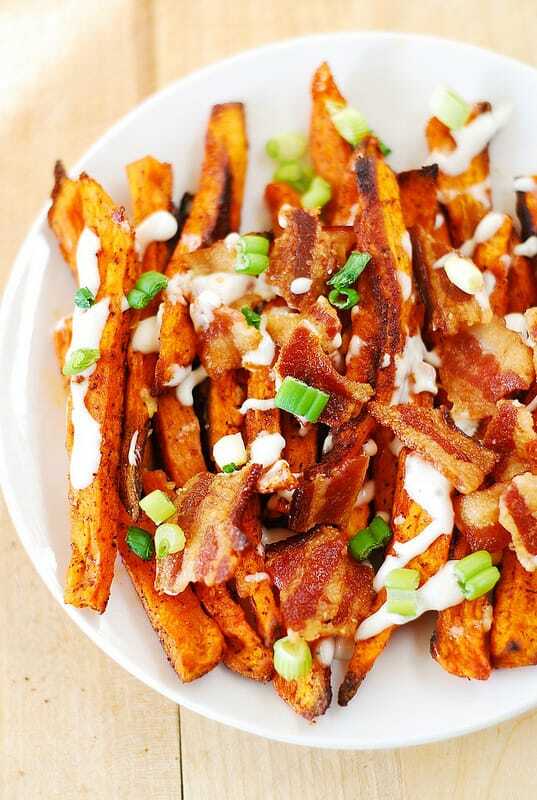 Sweet Potato Fries, Spinach, Bacon, and Egg Salad – with mayo-based dressing or Ranch dressing. So good! Thinly sliced sweet potatoes are sprinkled with lots of spices, such as smoked paprika, chili powder, cayenne pepper, cumin. Then, these sweet potato fries are baked in the oven. Serve these with bacon and spicy mayo or Ranch dressing! Peel the sweet potato, slice in somewhat thin strips (they don't have to be too thin). In a large bowl, toss with spices and 3 tablespoons of olive oil. Spread in one layer on aluminum foil lined baking sheet, without crowding (there should be space between any two potato fries). Just like all potato fries, these are best served right out of the oven - that's when they are at their crispiest. To serve, sprinkle with extra cayenne pepper and extra garlic salt (or regular salt), if desired. Sprinkle with chopped green onions or chives. Serve mayo (spiced up or plain) or Ranch serving as a dip (optional). Oh yum! Nothing better that fries and bacon. All that salty oiliness – great soul food.